I figure other kids (with or without autism) will find it engaging too. a book you can use to help teach children the days of the week. Here's his review, I only changed the formatting. On Sunday, Grover’s mother said that his uncle georgie is coming on Saturday. 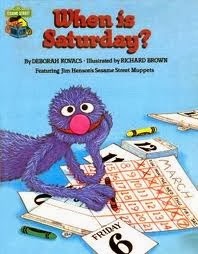 Grover wanted to know when Saturday was. then Wednesday, then Thursday, then Friday, then Saturday. Grover said that it was too many days so his mother made a calender. On Monday, Grover cleaned the house. That afternoon, Grover made shapes out of clay with his friends. On Tuesday, Grover went shopping for vegetables with his mom. That evening, Grover ate vegetable soup. On Wednesday, Grover went to Ernie and Bert’s house. Ernie and Bert took Grover to the library. Big Bird was there. They heard a story called “Rumplestiltskin”. On Thursday, Grover jumped on the rope fifty-three times without missing. Cookie Monster came to Grover’s house. That night, Cookie slept with Grover. On Friday, Grover went to the park. On Saturday, when uncle Georgie came, Grover recited a poem about the days of the week. Georgie really liked it. he still prefers picture books even as we drag him through young adult novels. consistently brings the best children's shows to Nashville. without worrying about the neurotypicals around you. seemed overly affected by them. performances will be sensory friendly enough for many. If your child gets loud or needs to move around, you can use the comfort room which has a good view and adjustable sound-of course it may also have crying babies. Be aware that people in the middle near the front may get soap bubbles on them. Lilly (Amanda Card, who effortlessly radiates the happy Queen of the World Lilly vibe) puts on a cat mask to scare some bullies and uses her squirt gun to chase them away and protect her friends. If you're interested, here's more information about this show. Many children with autism have an affinity for music. evidence to support that we're all born with perfect pitch). kids in a way that minimizes differences and builds on strengths. did not always stick with the program, he enjoyed it. with your child at home or, if you're lucky, at your library. filled with rice or beans. And don't forget pots and pans! and Nifty Thrifty Music Crafts by Felicia Niven. 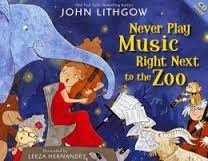 by the absurdly multi-talented John Lithgow. their age. Have fun exploring!